Town skipper Matty Brown says The Shaymen “didn’t show up” in their 1-0 defeat at Chesterfield on Saturday. 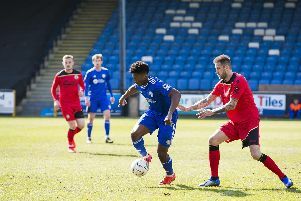 Former striker Scott Boden’s second-half penalty consigned Halifax to defeat, a result which leaves them two points above the National League relegation zone, and lifted Chesterfield out of it. “We knew how important the game was. We knew we could have kept them at bay points-wise with a point,” Brown said. “But we worked all week on going there to win the game, and to be honest, as players, we’ve got to take responsibility because we didn’t show up at all. “In previous weeks, our performances have been getting gradually better and better, but on Saturday we were absolutely miles off it. “I don’t think we deserved anything from the game, we didn’t do enough defensively to stop them or going forward to try and score goals. “It was one of those days where we had a really bad day at the office. “At this stage of the season we can’t really afford to have them. Brown admits he was at fault for Chesterfield’s penalty, when he barged Boden over in the box. That was the first goal Town have conceded in just over five-and-a-half hours, while their wait for a goal of their own now stretches to just over six hours. “In previous weeks we’ve been creating chances, so it wasn’t really a worry for me, as mad as it sounds,” Brown said. “Saturday we had Quigsy’s (Scott Quigley) header, a few half-chances but not really a gilt-edged chance. “But I put Saturday down to a really bad day at the office because nothing worked out for us. “Even something we pride ourselves on - our defensive stability - I hold my hands up, I don’t know what I’m doing for the penalty, it was uncharacteristic.